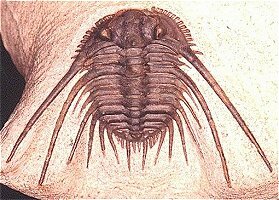 Interestingly, the development of trilobites with spines is opposite to effacement and makes it impossible to practice the suggested burrowing lifestyle. 'Spines may originate from just about any part of the exoskeleton, especially the margins. Sometimes these patterns provide consistent and diagnostic characters for higher classification (for example, the pattern of pygidial spines among odontopleuroid Lichida). However, as seen in the spinose species below, development of spines occurs in many orders of trilobites." Why did Nature provide some trilobites such handsome spikes? "The development of spines is commonly thought of as primarily a defensive adaptation, and increased spinosity is seen in a wide variety of trilobite species." This line of argumentation suggests that where trilobites were living there was someone interested in them as food. The ones with spikes survived better and increased while those without perished to the mouths or whatever it was that ate them. In strict Darwinian explanation I guess the assumption would be rather mechanistic: those random mutation of trilobite species that got by pure chance spikes did well in the fight for survival and so they got somehow bigger and bigger until the animal was really spiky! flotation/stabilization structures for slow-swimming taxa." I have the personal feeling that the explanations evolutionary biologists give for the function of the spikes helping the animal to defend itself passively and to balance itself while floating or on silty surfaces. But it does not provide adequate explanation why or how they came into being.